A targeted drug that is effective against trichomonads. Vaginal pessaries based on micronized form of metronidazole ensure quality treatment of trichomonas and non-specific vaginitis. One pessary contains 500 mg of metronidazole. Metronidazole is a 5-nitroimidazole derivative. It exhibits a broad-spectrum antimicrobial activity against the gram-positive and gram-negative obligate anaerobes as well as protozoans. If administered intravaginally, systemic absorption of metronidazole is minimum. 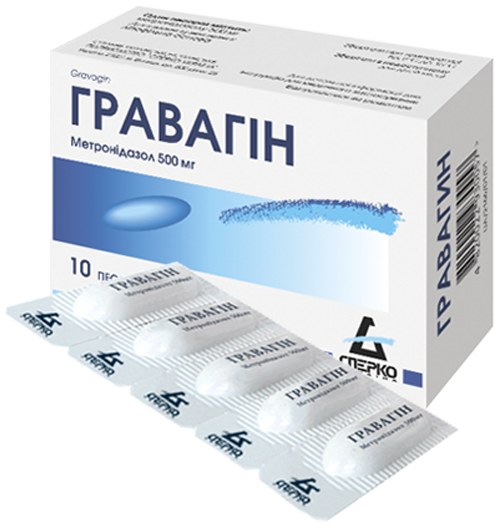 For detailed information on the medicinal product Gravagin, please see “Package leaflet” page. Marketing authorization of MoH of Ukraine No.UA/2166/01/01 dated 19.06.2014.